Brennan Johnson is following in the footsteps of his father Bryce, a retired Methodist pastor who built one of the first communal wood-burning bread ovens connected with a church in Minnesota. But Brennan is an itinerant artisan baker, immersed in learning as much as he can about the old ways of fermented dough baking, inspired by European traditions. But carefully studying the history of how those traditions were transformed and adapted by agricultural and ethnic influences as waves of people migrated to American shores. Embodying the youthful spirit of the journeying shepherd in The Alchemist, Brennan is passionate about achieving his personal destiny, embracing a strong respect for the environment and being an acolyte for re-educating people about what good bread can be. “Making the dough is a gentle exercise, graceful and grace-filled. The full baking process is arduous. While the dough is resting the fire needs stoking—often a full day ahead of time so enough heat is absorbed into the bricks. Two days before the bake a portion of the flour is mixed with the levain, activating a living, vital base for the dough. A porridge of grains might be cooked to mix into the dough, nuts and spices toasted, grains sprouted or cracked and malted. A full symphony working in harmony. I simply conduct, beckoning for more acidity from the sourdough, more fermentation from the active bacteria, more sweetness from the grains, but ultimately asking the ingredients to work their own magic." Bread’s history mirrors the evolution of food culture over the last few centuries, becoming simpler, whiter, more refined. But it wasn’t always so; long ago most people ate dense, dark breads made from coarsely milled whole grains. Observant cooks discovered that wild yeasts just floating about in the air loved a bowl of gruel made from starchy flour and water—the yeasts ate the natural sugars from the grain, excreting CO2 . The bubbly brew became the heart of sour, or fermented, doughs. Since the 1600s in France, a levain or chef, became a bread starter before commercial baker’s yeast was available. Brennan takes a page from his father’s playbook this year, stepping in as a January winter break baker-in-chief for Companion Breads, a CSB—or community supported bakery. Supported by monthly subscriptions, customers pick up freshly baked hearth loaves each week from a large basket on the front porch of their suburban home, tucked in at the end of a cul-de-sac. But with a telltale smoke trail rising from the brick oven out back, in a yard surrounded by woods. CSBs, modeled on the same philosophy of CSAs, provide bakers who don’t have brick and mortar space a way to generate a steady stream of business each week. And it guarantees efficiency and sustainability—no homeless loaves at the end of the day, as every one baked is paid for in advance. 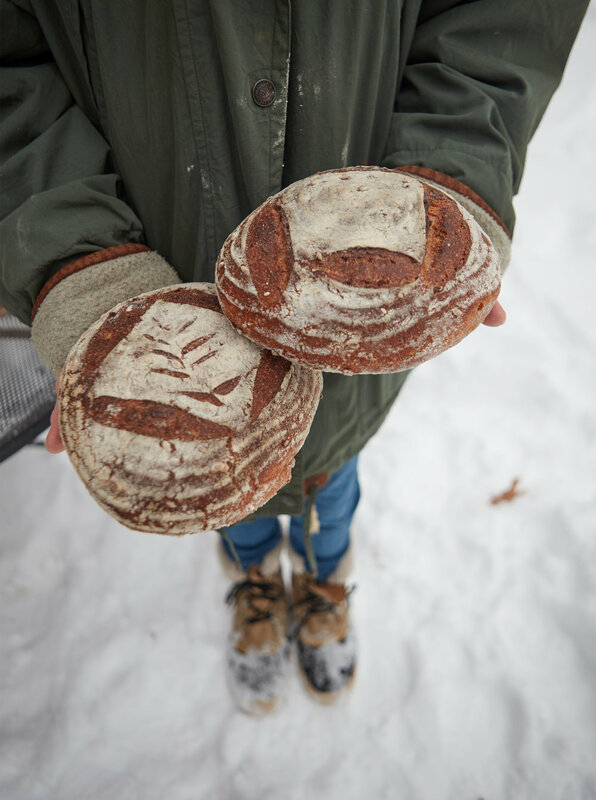 Some bakers will hold pop-up sales where customers know in advance when bread is available or bring loaves to a specified place, like a local coffee shop or brewery, for pick up. There are as many models as bakers, with no shortage of creativity. Many of these bakers are an integral part of the movement to bring back heritage grains and revive baking methods that could be lost to history. 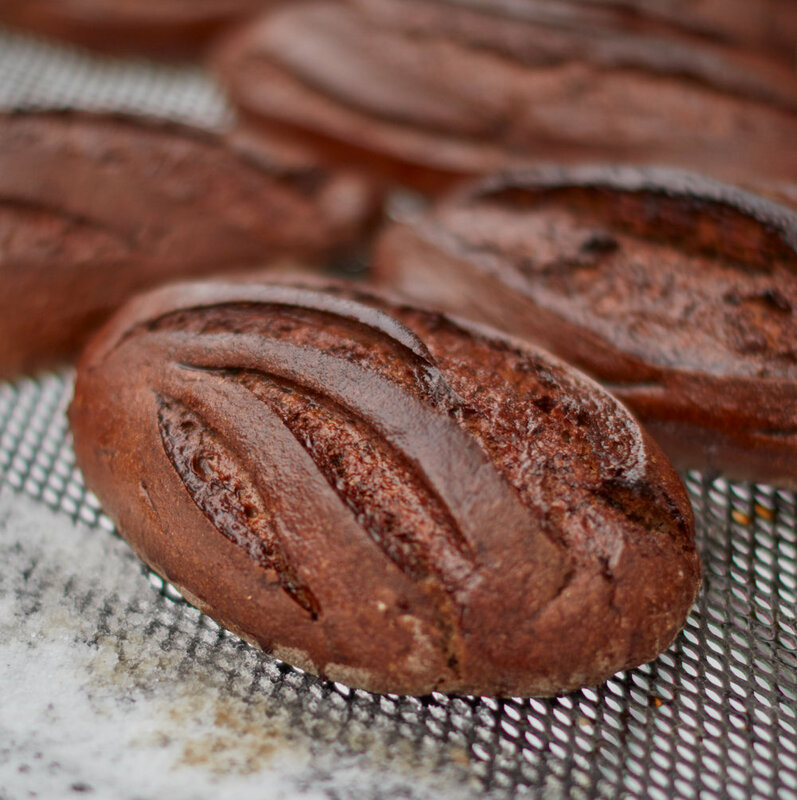 Brennan’s adaptation of a traditional Finnish sweet and sour loaf explores the use of rye flour in the Upper Midwest. His goal was to create a dense, slightly sweet sourdough rye, with a seductive and subtle flavor of caraway seed and a whisper of anise and fennel. In his research he learned of a basting process that cooked down leftover coffee (yes, maybe that Scandinavian church basement ladies’ coffee) and a sweet syrup. He decided to use local maple syrup and experimented with brushing the dough halfway through the baking, then at the end. He formed elongated loaves with a flax couch cloth, a French method for shaping baguettes. Once a long, cool rising is complete he slashes each loaf with quick, sure motions of a razor blade. Ashley is a crucial partner for basting as Brennan slides the loaves in and out of the oven. The final bread has a slightly sticky and bittersweet edge to the crust, with a chewy, dense, and addictively moist crumb on the inside. Spectacular either fresh or toasted, with the best butter you can find—a highly successful effort. Ashley Knighten, Brennan’s pastry chef colleague at the OWL (Old World Levain) Bakery in Asheville, North Carolina, joined in for this winter bake. The irony of their bold north visit from the south, baking outdoors in the snow and cold, isn’t lost on their appreciative audience. As the bricks of the oven cool, so many other kinds of baking can happen. Just as when communal ovens were the center of small community life, Brennan’s family takes advantage of doing more than baking bread. A chicken may be roasted. Or alluring pans of delicate millefeuille pastry, made with whole grain flours, bake beautifully on the hot bricks—becoming deeply browned and crisp in a way no indoor oven can achieve. Rich and luscious, with a filling of coconut pastry cream and a blood orange marmalade. And in the stillness of the winter air, there are few aromas, so the fragrance of baking bread and buttery pastry perfumes the entire neighborhood. Earth, wind, and fire. There’s nothing more elemental than harvesting grains, grasses, and starchy roots from the land. Grinding, parching, drying and mixing with liquid. Waiting for the wild yeast. Balancing the ratios of moisture and dryness. Determining the length of the ferment—how sour shall the flavor be? Texture, elasticity, softness; kneading, slapping, sculpting into form, slashing. 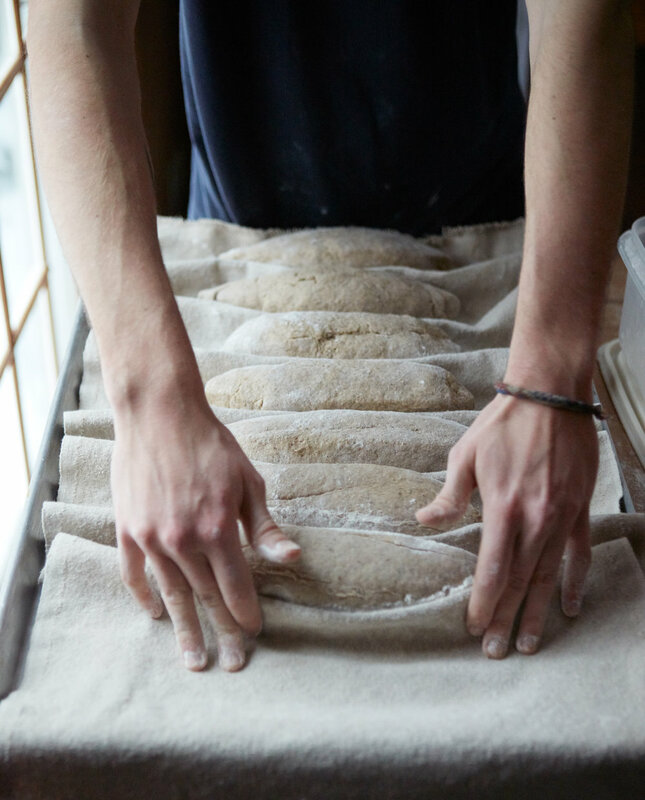 There is a poetry in creating bread doughs, contemplative and quiet, a reconnecting of the body and hands. Then an artistry and chemistry to baking them, just so, at the right temperature. Gathered wood slowly burning to ash, heat radiating from hot stone, moisture-saturated air surrounding the formed dough. A toothsome crunch and caramelized char, a comforting tenderness to the crumb, a satisfying finish to the grainy flavors spiked with seeds, spices, sugary syrups. The mindful and resourceful craft of regional baking is a window into what was abundant or just plain available at any point in history. The providence and sustenance of the earth celebrated at the table every day, conveyed in the magical process of transformation and creation.